The opening encounter of the third day of the Pro Kabaddi League 2018 season six produced some nail-biting action as Dabang Delhi and Gujarat Fortunegiants fought tooth and nail to eke out a 32-32 draw at the Jawaharlal Nehru Indoor Stadium in Chennai. 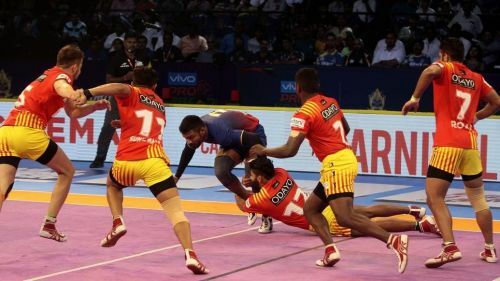 Dabang Delhi were dealt an early blow as they succumbed to an all-out as early as in the sixth minute which saw Gujarat race away to a 9-2 lead. As the opening half neared a close, Dabang Delhi opted to bring on Chandran Ranjith, their most expensive buy from the auction, into the action and he struck with his first raid. Going into the break, the finalists from last year enjoyed a slender five-point lead as the scoreline read 17-12 in favor of the Sunil Kumar-led side. In the first few minutes of the second half, the two teams traded points as the lead remained static at four points before Gujarat galloped away to a 28-20 lead owing to some errors from the Delhi defense. However, with just five minutes left on the clock and Chandran Ranjith running riot, Delhi inflicted a timely all-out on Gujarat that brought the deficit down to just two points. A herculean effort from Ravinder Pahal brought the score to a tie before a host of empty raids culminated in a 'safe approach' from Pawan Kadian as the two teams shared mixed emotions at the final whistle. Leading the side for their opening game, Joginder Narwal was not in the best of form and was often seen wearing an animated look on his face as the aggression brought out some serious nerves that slightly affected his game. An unknown entity in the Pro Kabaddi League, Naveen's repertoire from the Nationals earned him a spot in the starting seven over Chandran Ranjith, and Pawan Kadian and he did not disappoint, making life difficult for the opposition but at the same time, lacking the experience to tackle crunch situations. 'The Hawk', who returned to Dabang Delhi, the team he started his journey with, had a good game, with a mix of patience and aggression. His experience helped Pahal to come up with the holds and blocks at the right time. A senior man in the squad, Shabeer Bapu did not get too many chances to prove his mettle as he finished with just one point from four raids, but he did provide a good helping hand on the defensive front. The Iranian, who captained Delhi last season, played a very small part in the game, as he was replaced by Viraj Vishnu Landge, after the former picked one point from two raids and an equal number of tackles. Visibly annoyed at the lack of opportunities that came his way, Vishal was often subjected to being the target of the defenders and his three tackle attempts all went in vain. The veteran defender, who has plied his trade for U Mumba and Patna Pirates seemed absent from the defensive front as he failed to produce a single tackle but essayed a role of a contributor to chain tackles. Delhi's costliest buy from the auction, Ranjith surprisingly did not find a place in the starting seven but made a grand entry, picking two points from two raids. He continued his rich vein of form, single-handedly keeping Delhi in the hunt as he finished with 10 points. One could often see the fact that Kadian was keen on shouldering the raiding duties but he could not do a great job at that, with just 3 points from nine raids. The youngster was a force to reckon with last season and proved his worth with the minimal opportunities he was given this match, with two points from the two tackles he made. The experienced all-rounder was yet another notable absentee as he came on for just a solitary raid, a DO OR DIE raid where he easily gave in to the Gujarat defense.